12:13 I'm going to call it a day, having done the planned trades. If you hang around, watch for a late rally. Thanks for coming. See you next week. Take a course or two or three. 9:36 Friday mornings often have a 20/110 false signal, then a "hook and go"
9:06 trading at 315 degrees, on the 8th harmonic balance point. may not get an early dip; 110 and 440 minute EXMAs are up. 8:48 the overnight trend was up. 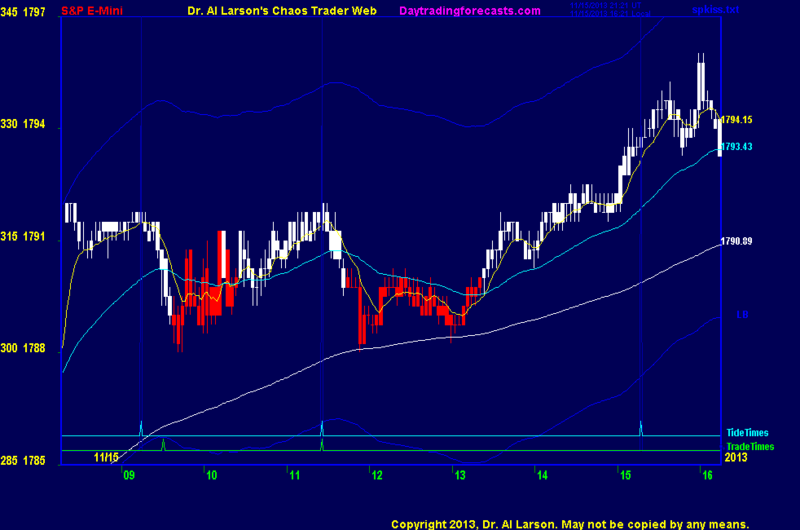 Currently we are in a pullback within that trend. 8:41 yesterday's late support was on the Moon +T270 electric field flux, which is about 1788 this morning. There is a late 3:17 low , suggesting a late rally, but it was not a trade selected by my software. 11/15/2013 10:05:14 AM MT bbb****:: Que interasante! 11/15/2013 9:55:21 AM MT bbb****:: Home with flu. Just checking in. Glad I am not trading today. 11/15/2013 8:19:23 AM MT Tg****:: Good morning Al, MM, BBB, everyone.